As another year wraps up I thought I’d update my annual mention of a few of the people and organizations making the world a better place. Yes, even after the indescribable acts we’ve experienced this year, we need now more than ever, to focus on the good that surrounds us. Some of the organizations are local and some faraway but all deserve high praise for their vision, commitment, dedication and generous spirit. This year the list includes some smaller and perhaps not yet well-known organizations but their vision and passion give me personal inspiration and hope for the future. Take an opportunity to fill yourself with the warmth and love generated by these stories. Greetings of the season to all my friends and family. Winters are pretty cold here in the Great Northeast and making a conscious decision to jump into a freezing cold lake on January 1st takes more than courage. It takes a reason so strong and so compelling that people who normally act quite sane are happy to take part in this annual event. 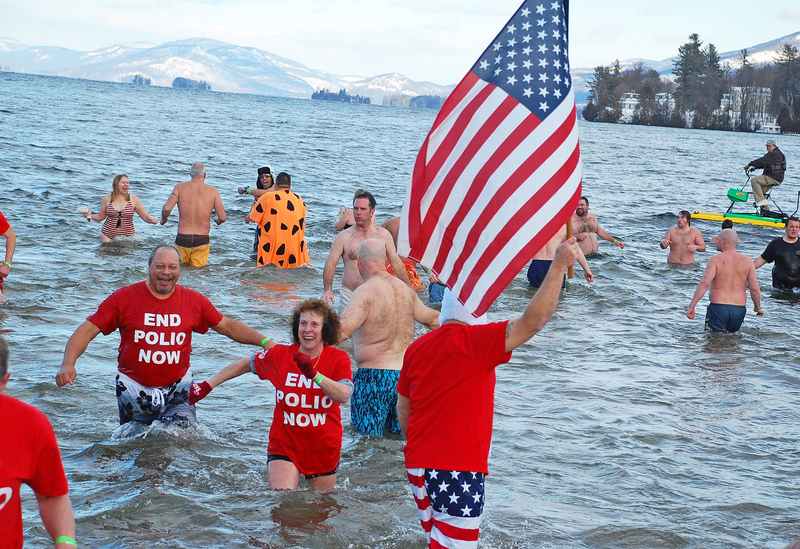 So on any given New Year’s Day you will find many Rotarians from District 7190 getting ready to jump into Lake George in upstate New York. It’s a hardy band of high-spirited people called Polio Bears who annually take the plunge to raise money for polio eradication. Initiated by the Wilton Rotary Club many years ago, Rotarians from the District’s 42 clubs joined the fun in 2007. Usually led by the current District Governor the group gets together early in the day for a hearty breakfast and then begins the routine of prepping for the plunge. Much laughter erupts when someone shows up wearing a funny hat or other crazy gear. 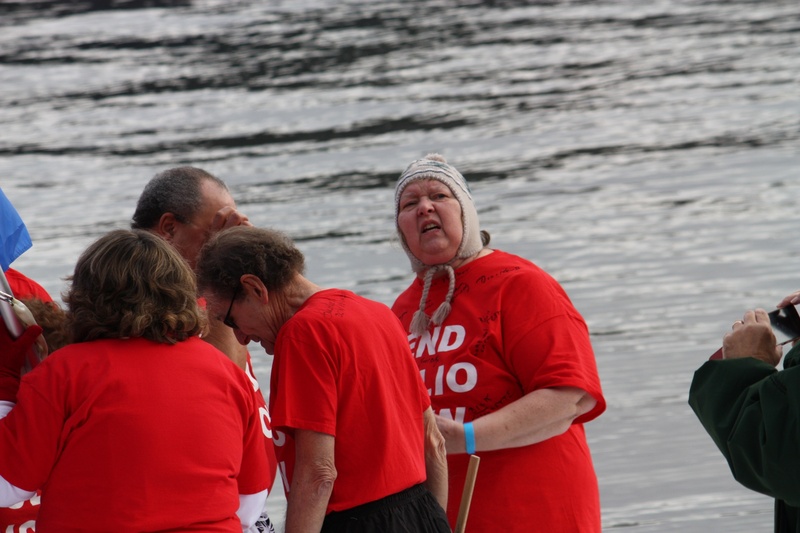 The bright red End Polio Now tee shirts are easy to spot from shore when the bell rings and everyone rushes into the lake. You can hear how cold the water feels by the screams and shouts. The water is usually about 43 degrees but it’s the wind chill that really determines how frosty you get. Then it’s back to the shore for foot warmers, fleece wraps, hot cocoa, coffee or drink of choice, cheers and lots and lots of pictures. District Governors who opt to stay on dry land find countless ways to raise money to stay out of the water. 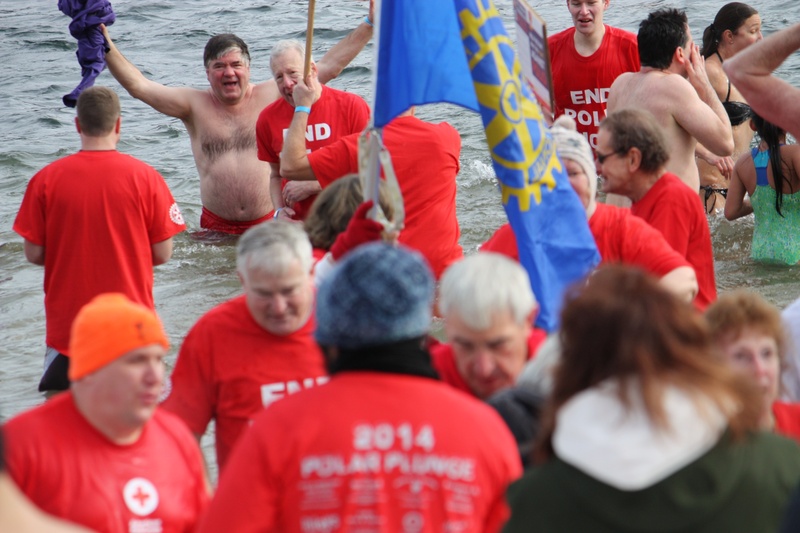 And Rotarians who want the Governor to ‘go jump in the lake’ find countless ways to convince them to take the plunge. This year, Rotarians raised over $10,000 to see the Governor get wet. 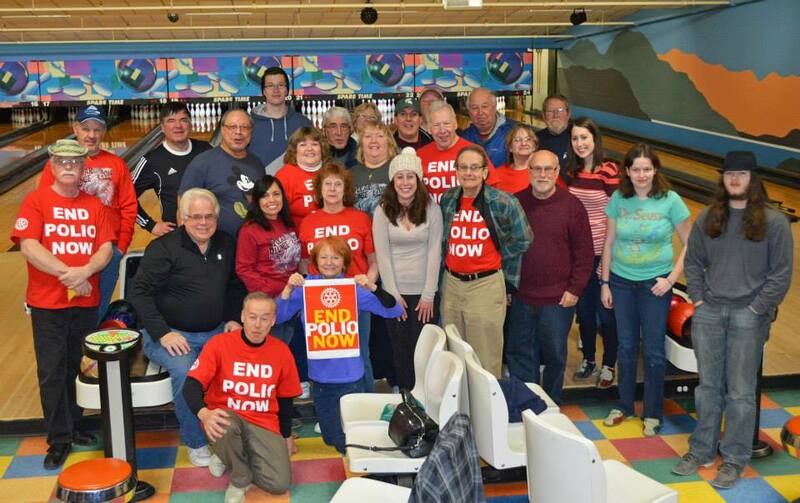 A great new event was added this year to give other Rotarians and their families a way to contribute to polio eradication and have a great time on New Year’s Day without getting wet. Planned and put together by the End Polio Now committee, eleven bowling alleys around the nine county district held the Pinning Down Polio Tournament with spectacular results. More than 250 people took part in this fun day with almost $25,000 in total raised with donations still rolling in. With the Bill and Melinda Gates Foundation matching every dollar raised for polio eradication with $2 this annual event raised over $75,000!! What do you do when you find out there are children and families in your hometown without Thanksgiving Dinner? Well, if you are TJ Tracy you say, “Mom we have to do something about this.” And then go out and do it. Again and again and yet again for the past four years. Now 13, TJ has raised enough money during these past years to provide hundreds of Thanksgiving Dinners to the Franklin Community Center in Saratoga Springs, New York. This year he is closing in on $10,000 which will also be used to give holiday gifts for children in the community. After hearing his story, local residents stepped forward to support his mission. Several local restaurants held Eat and Feed dinners with a percentage of the proceeds going to feed hungry children and families. TJ has had many interviews with local media and the Saratoga Springs Rotary Club named him one of their 2013 outstanding citizens, the first time a young person has received this honor. TJ has turned this grassroots fundraising effort into a mission to do something about the hungry children in our communities. TJ knows this is about more than turkeys. He knows this is one of the most important issues facing millions of children and their families in this country today. And he has a plan. A pretty big plan too. TJ’s assessment – if each of the 6o million children in the Untied States could raise $10 there’d be over $600 million to put towards feeding hungry children and families. A really simple and kid -friendly plan that might just work and certainly capture the imagination of young people everywhere. Those of you who read my stories about people having the courage to step forward and make a difference know I particularly have high regard for children with the passion and courage to take on huge challenges. Alex’s Lemonade Stand, Free the Children, and most recently , Nik Toocheck who is running marathons on every continent to raise money to buy brand new, warm winter coats for children in need. Now I’m adding TJ to this list of movers and shakers – I’m going to follow where his passion leads him and let you know what’s next. For more information please check out his Facebook page ww.facebook.com/TJsTurkeys. PS – what’s next? Tonight TJ and his volunteers are shopping for Christmas dinner and school break breakfasts and lunches for 35 families. Many of you know I’m a Rotarian and write about Rotary programs that mean a lot to me but I rarely write about anything personal. Today is different. I’m going to tell you a story that affected my Rotary life and my belief in Rotary’s mission of peace and understanding. Some background first: Group Study Exchange (GSE) is a very important program of The Rotary Foundation. Two Rotary districts from different parts of the world exchange vocational teams of, usually, 4 non-Rotarians with a Rotary team leader. Teams may be multi-vocational or represent a single vocation.. The team spends a month in the host district learning the way their vocation is practiced, participating in events, living with Rotary host families for a week at a time, immersed in the culture. Back in 1999 I hosted a member of the Group Study Exchange team from Peru, composed of medical professionals. Diana Fuentes was an ophthalmologist, a delightful woman with a great personality. When we met I was happy to find out that she was quite proficient in English. I also learned that she had just been awarded a fellowship to London University Hospital and I would need to help her with the many details. Peru to New York to London – what an adventure. In 1999 I had a simple computer, dial-up connection to the internet, an email address – no Face Book, Twitter, iPhone, but it turned out that we had all we needed plus Rotary. The first order of business was to contact Diana’s sister in Peru to mail the needed paperwork to London. That took an email or two but was completed quite quickly. Then Diana had to be certified as fluent in English. This was not so easy because we had no contact information for the professor who had tutored her in English. Late one night as we huddled over the computer, searching for him, we found an email address. Fingers crossed we sent an email asking him for the certification. Up at 6 AM we ran to the computer and saw an answer. But it was from his secretary with the news that he was hiking in the Himalayas and had no communication tools with him. Stymied and time was running out. Then Diana remembered that she had met the president of a Rotary Club when she was in London. But she couldn’t remember his name. Knowing that Rotarians around the world have strong bonds I suggested we send an email out to as many London Rotary Clubs we could find. Our plan was to send this email in the early evening. But we didn’t need to wait that long. Rotarians in London had already heard about the fellowship and the president of one of the clubs walked into London University and certified Diana in English!! 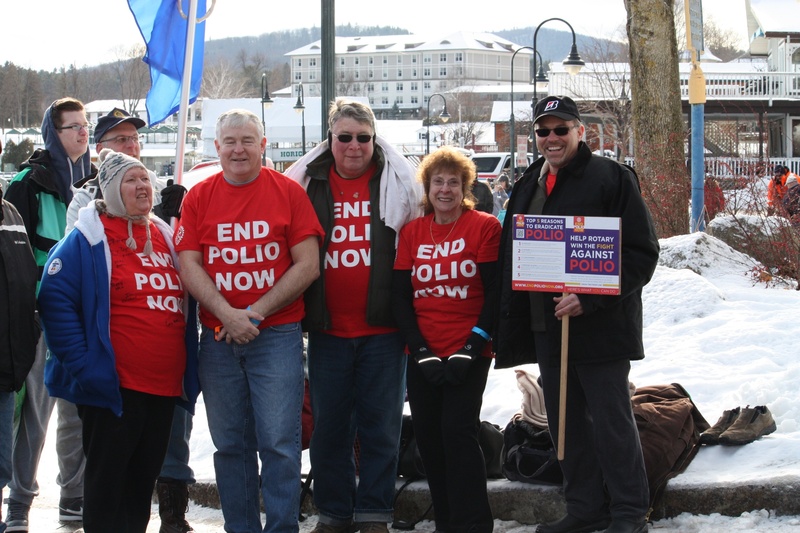 An amazing story of the far-reaching arms of Rotary. Even now, thinking back, I feel the tremendous impact this had on me. Here we were halfway around the world and people we didn’t know (Rotarians) reached out to help. As with so many things, Rotary cuts through red tape, works directly with other Rotarians; it’s just the way it is in Rotary. As with all things, change is coming to the GSE. In July 2013 it will morph into Vocational Training Teams. These teams will work in different districts, training their counterparts in new and better ways to do things. Although things are changing I believe that the message of peace and understanding will always shine through and look forward to meeting the new teams. Whether steeped in Greek mythology, fable, fiction or allegorical, Ekecheiria, or The Olympic Truce captures the imagination. What we do know is that Greece was in a long and bloody civil war and, based on stories passed down through the years, the kings of three city-states, Elis, Pisa and Sparta, traveled to Delphi, hoping the Oracle could use her mysterious power to find a way to hold the athletic games in Olympia without further bloodshed. The oracle was the sanctuary dedicated to Apollo and the spokesperson for Apollo was the priestess called the Pythia. Legend says that the Pythia would fall into a trance allowing Apollo to possess her spirit. From this state she prophesied about everything from public policy to personal matters. One of the prophesies was that of The Olympic Truce: every four years the games would be held, war would be suspended, armies would be prohibited from threatening those participating in or attending the Games, legal issues and the death penalty were forbidden. This was the common basis for peace and harmony among the Greeks and the forerunner to the modern Olympic Games. Athletes, artists and their families, as well as ordinary citizens would be allowed to travel safely both before, during and after the games. The sanctuary of Olympia remained a tradition for centuries. 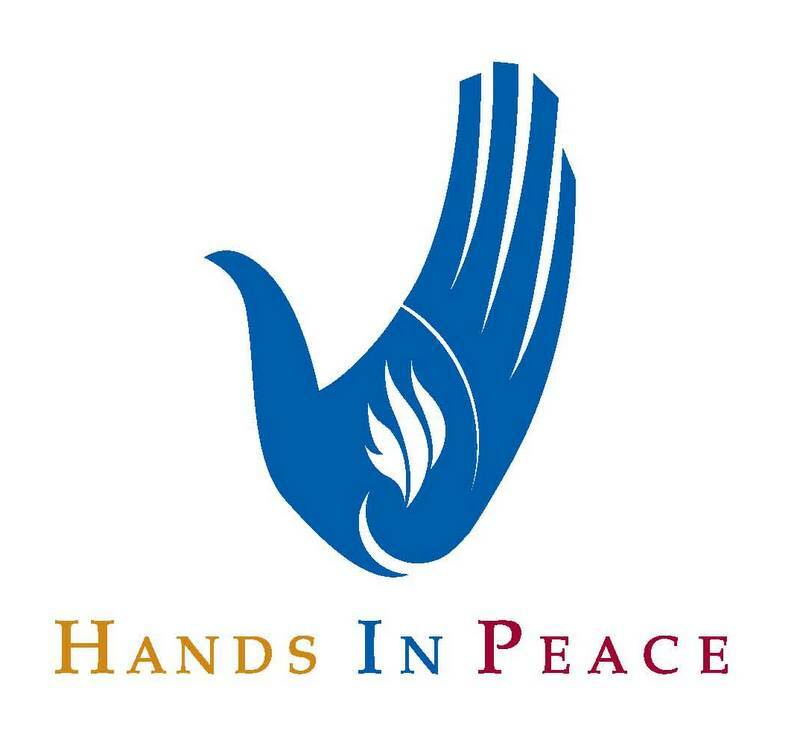 The Truce represents a wish for peace and the Hands In Peace Games puts peace into practice. Pep’s Note – there are as many versions of the Oracle at Delphi, The Truce and the Olympics as there are stars in the sky. I hope you like this simple version. As wars appear to rage on and conflict takes its toll in human misery, a unique group of people are infusing the world with a spirit of peace, tolerance and understanding. These Rotary Peace Fellows are professionals trained in the root causes of conflict, the theories of international relations and effective models of cooperation, conflict prevention, sustainable development and social change. Currently working in governance, diplomacy, nongovernmental and private organizations, these Fellows have studied a broad range of topics including human rights, ethics and world politics, arms control, peacekeeping, international law and global women’s issues at one of the six universities hosting a Rotary Peace Center. They are leaders in their profession and in their national and international volunteer service. They are the faces of peace and conflict resolution that Rotary has long believed possible. Rotary Peace Fellows began traveling abroad to pursue master’s level degrees in 2002 and now number almost 500 strong.. University partners are located at Duke University and University of North Carolina, Chapel Hill in North Carolina; International Christian University in Tokyo, Japan; Universidad del Salvador, Buenos Aires, Argentina; University of Bradford, West Yorkshire, England; University of Queensland, Brisbane, Australia. Each university partner has a unique curriculum focusing on aspects of international studies providing a broad range of academic experience. In 2006, Rotary created a shorter professional development certificate program designed to attract mid-to-upper level professionals already hard at work in peace related fields. Rotary selected Chulalongkorn University, Bangkok, Thailand for the intensive three to six month course designed to expand the participants’ global outlook and strengthen their abilities making a positive impact on future peace work. When you meet a Rotary Peace Fellow you will never forget it – a deputy high commissioner for the court in Zambia, a doctor working to provide neonatal care in an area of the world where many children die in infancy, a mediator implementing better social and environmental policies, a humanitarian aid agency officer, an educator working with youth from different religious and ethnic groups to prevent future conflict. Click here to see more of these beautiful faces of peace. 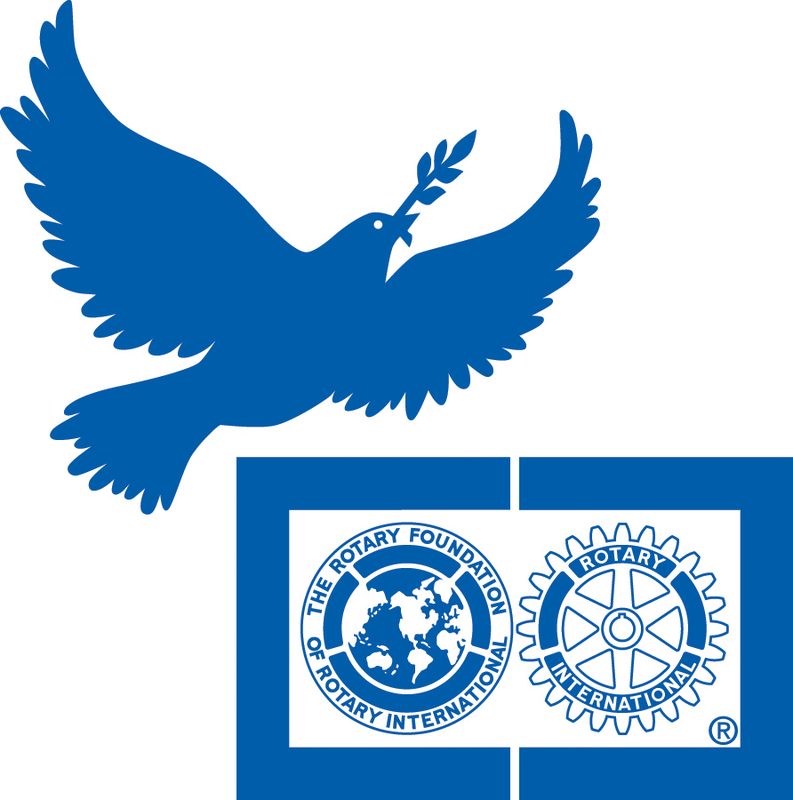 The Rotary Foundation of Rotary International conducts a globally competitive search for Peace Fellow candidates each year. Candidates must apply through a local Rotary Club and complete an application that includes academic transcripts, test scores and all related documents required for admission the university of choice. Interested? Do you know someone who is ready to make this type of commitment? Watch this short video and then go to How To Apply for more information.